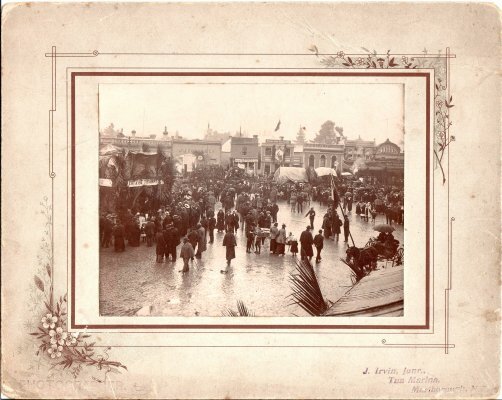 Description Photograph of the celebration of the Coronation of Edward VII 1902. The Beef a la Maori stand is on the left of the photograph. It is raining. In the background are the shops: T. Eckford agent S.S. Opawa; J.J. Corry & Co.; G.K. Wakelin printer & publisher, National Bank of New Zealand; F.L. Rathbone & Co.
16 June 2009 added by Jenny Pierson: Back of photograph has a white sticker with, "Coronation of Edward VII 1902". The word, "Draper" [but does not fit with any Draper donations], and the words, "Coronation of Edward VII 1902, Celebrations in Blenheim were on 11th August 1902 signed D.M. Furness" - this in reply to someone else having written, 26th June 1902" - photograph doesn't fit with any Furness donations or Marlborough Express donations either. D.M. Furness took over the Marlborough Express in 1946. This photograph was scanned in 2008 and the scan was put in the Changing - Photographers of Marlborough display where it still is in June 2009. Another scan of this photograph is to be used in the Changing European History Gallery 2 display in commemoration of the Marlborough Provincial 150th anniversary on 1 November 2009.